​​​​​​​​​​​ HOUSTON, CORPUS CHRISTI – You may know this already, but you're about to meet the most charming men and women in the world. Here, in your hours of greatest need, you'll receive an unwanted barrage of telemarketers, deceitful fliers and obnoxious front-door visitors. They all want one thing. Your signature on a contract. With two questions you can tell if they're knowledgeable and ethical. 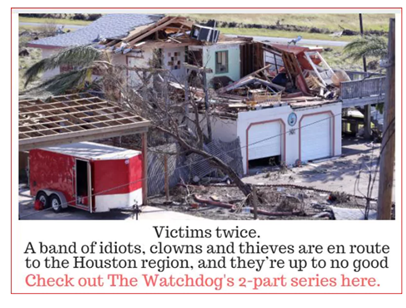 Be sure to read by Dave Lieber's full Dallas Morning News story.​​ Also check out Watchdog by Dave Lieber.